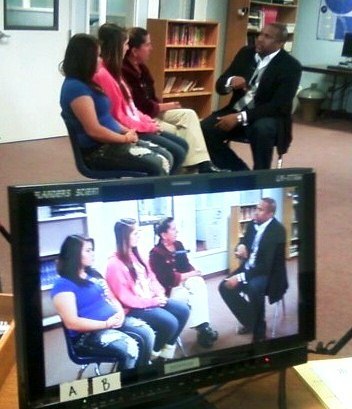 Tavis Smiley Reports, a PBS investigative program, visited Spokane for a prime time special examining the American juvenile justice system. The program, Education Under Arrest, included interviews with NEWESD 101 staff members providing educational services in the Spokane County Juvenile Detention Center (JDC) School and Structured Alternative Confinement (SAC) School. Incarcerated local students also were interviewed for the program, an examination of what is working on the frontlines of reform in juvenile justice. Host Tavis Smiley took his cameras to four states to examine the economic, social and emotional cost of zero tolerance policies that are placing more and more youth into the criminal justice system. The JDC and SAC schools are two of the three educational programs NEWESD 101 operates for juvenile offenders in Spokane County. The third is the Martin Hall Detention Center. The JDC and Martin Hall are maximum security juvenile detention centers, while the SAC School serves youth placed on electronic monitoring and those court ordered to an alternative school setting.